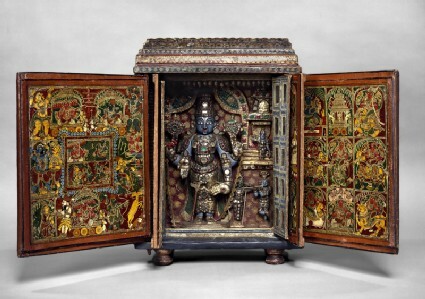 Portable shrines of this kind were used by travelling priests who narrated the stories of Vishnu and his incarnations. The shrine has extendable folding doors painted with scenes of Vishnu in his various forms, the stories of Rama and Krishna and other subjects. Presented by the Church Missionary Society, 1952. 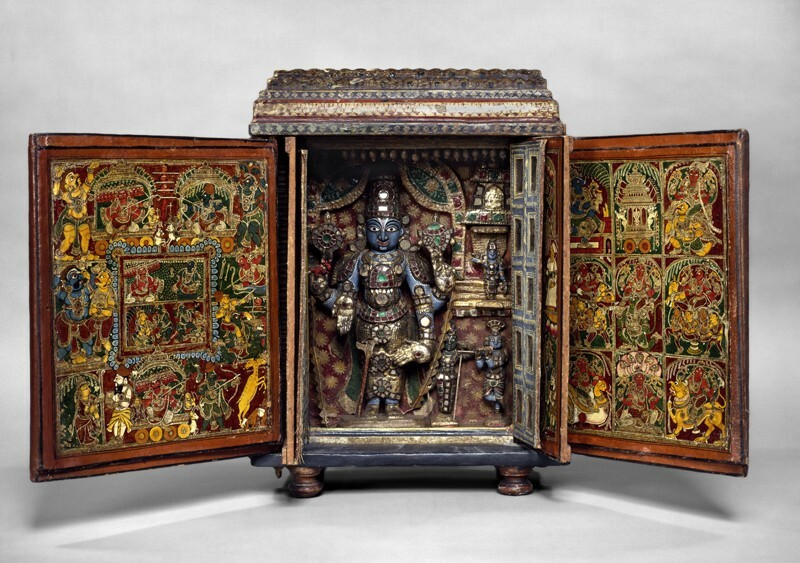 It is believed that portable shrines of this type, with multiple doors and folding panels densely painted with mythological scenes were used by itinerant priests who sang or narrated the sacred stories of Viṣṇu and his incarnations to village audiences. The two outer doors and their lacquered cloth flap extensions are painted (on the outer side) with scenes of Viṣṇu reclining on the snake Ananta, episodes from the childhood of Kṛṣṇa and the Rāmāyaṇa and various figures of deities. On the inner sides appear Rāma enthroned and standing figures of Viṣṇu in various forms, including Veṅkateśa (as worshipped at Tirupati), Raṅganātha (as worshipped at Śrirangam) and Varadarājā (as worshipped at Kanchipuram). The narrow inner doors have figures of the avatars of Viṣṇu on the outside and deities, devotees and others on the inside. The flimsy innermost doors, with numerous rectangular mica windows, open to reveal the painted wooden image of Viṣṇu standing with cakra and śaṅkha in his upper hands, the lower hands in varada-mudrā and resting on his thigh; a sword rests against his other thigh. The figure is profusely encrusted with metallic and glass “jewellery”. 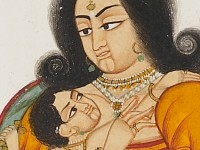 To the right are smaller standing figures of Rāma and Kṛṣṇa and, above them, Viṣṇu (?) beneath a snake-hood. The back and sides of the shrine are painted a deep blue with flowering tree designs with engrailed arches. The quality of the painted decoration is crisp and vigorous throughout. The presentation of the few surviving examples of these shrines is in part due to the Christian missionaries working in South India who sent them to Europe as documents of Hindu religious. The earliest such example, now in Halle (East Germany) was sent from Madras by the missionary Sartorius in 1733; another is in the Museo Missionario Etnologico in the Vatican. The present shrine was similarly collected by the Church Missionary Society. Another (of unknown provenance) is in the Museum für Völkerkunde, Munich.